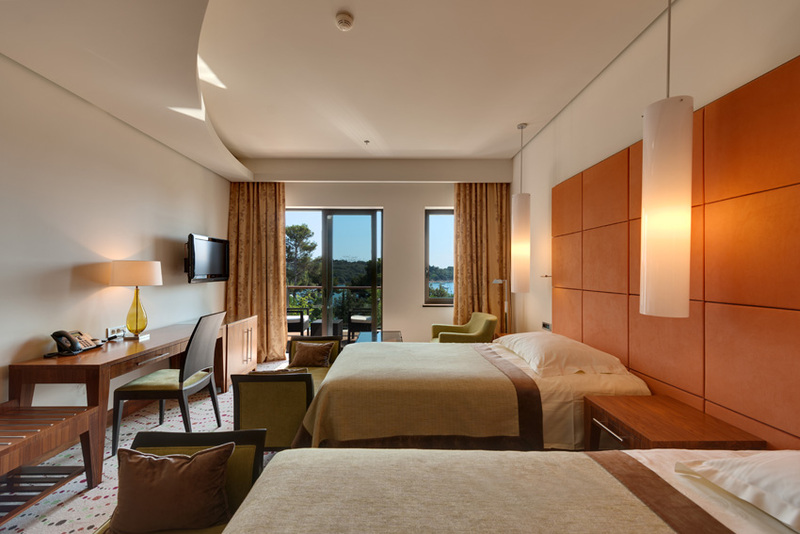 All of the 113 rooms and suites of Monte Mulini successfully combine natural materials and comfort with awe-inspiring views. Enjoy impeccable service and unparalleled luxury in style. Pets may only be kept in rooms, not in common and public areas, wellness centre, pool, restaurants, or bars. Exceptionally, pets may be kept in the marked green space in front of the hotel, lobby bar terrace, and Mulini Beach lounge, but they must be on a leash or inside a pet crate. Premium rooms located on the ground floor, enjoy an area of 39 m2. The rooms have a terrace or balcony offering a partial sea view through greenery. The rooms are decorated in warm and natural materials. All rooms are equipped with mini bar, pay and satellite TV, direct dial phone, wireless Internet access, personal safe and a wardrobe that can be accessed from the entrance hall and the bathroom. All rooms have luxuriously appointed bathroom with two washbasins, bathtub, separate walk-in shower, hair dryer, bathrobes, slippers and high quality luxurious amenities. 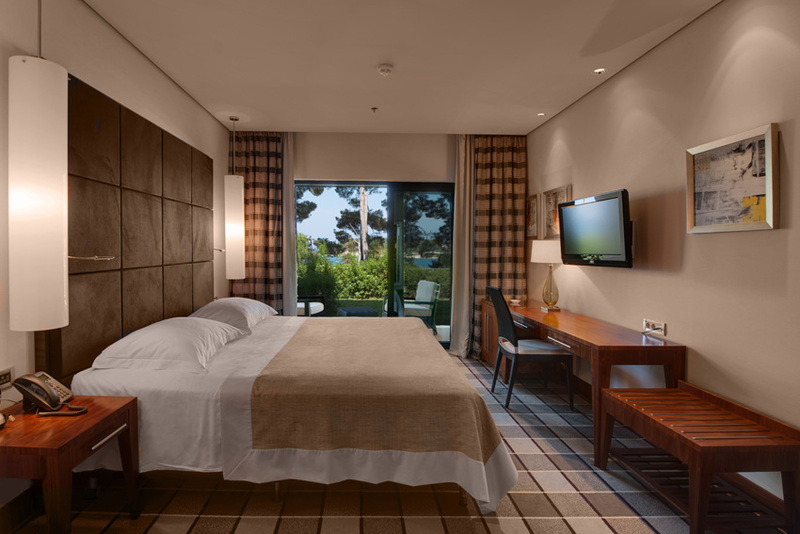 The rooms are available with king bed and red ottoman or with twin beds and a comfortable armchair. Pets are allowed at extra charge. Amenities: Complimentary bottle of mineral water every day, handmade local sweets once upon arrival and luxurious toiletries. 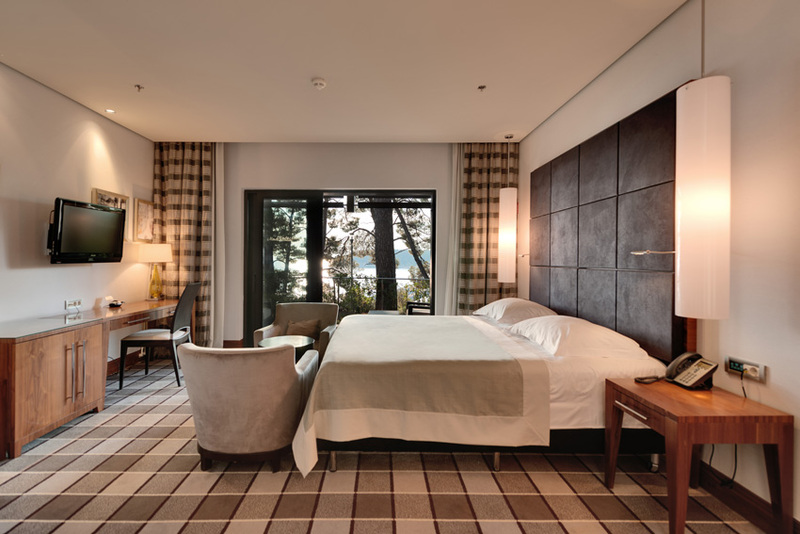 Deluxe rooms located on the higher floors, enjoy an area of 39 m2. The rooms have a terrace or balcony with direct sea view. The rooms are decorated in warm and natural materials. All rooms are equipped with mini bar, pay and satellite TV, direct dial phone, wireless Internet access, personal safe and wardrobe that can be accessed from the entrance hall and the bathroom. All rooms have luxuriously appointed bathroom with two washbains, bathtub, separate walk-in shower, hair dryer, bathrobes, slippers and high quality luxurious amenities. The rooms are available with king bed and red ottoman or with twin beds and a comfortable armchair. Two hotel rooms are adjusted for the disabled persons. Amenities: Complimentary bottle of mineral water every day and handmade chocolate pralines once upon arrival. A wine and olive oil tasting and a 20-minute test treatment at our Wellness & Spa Center once during the stay. Luxurious toiletries and a gift from the hotel. 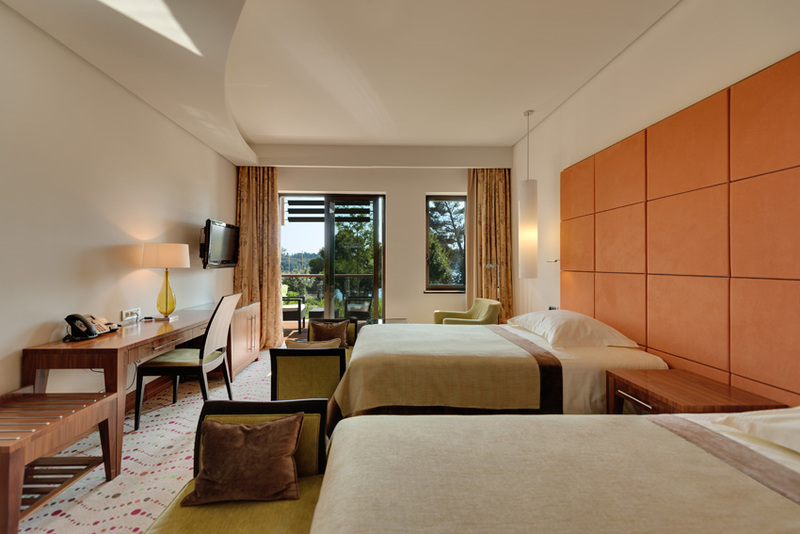 Executive rooms located on the higher floors, enjoy an area of 39 m2. The rooms have a terrace or balcony with partial view of the sea. The rooms are decorated in warm and natural materials. All rooms are equipped with mini bar, pay and satellite TV, direct dial phone, wireless Internet access, personal safe and a wardrobe that can be accessed from the entrance hall and the bathroom. All rooms have luxuriously appointed bathroom with two washbasins, bathtub, separate walk-in shower, hair dryer, bathrobes, slippers and high quality luxurious amenities. The rooms are available with king bed and red ottoman or with twin beds and a comfortable armchair. Amenities: Complimentary bottle of mineral water every day, handmade local sweets once upon arrival, wine and olive oil tasting once during the stay and luxurious toiletries. 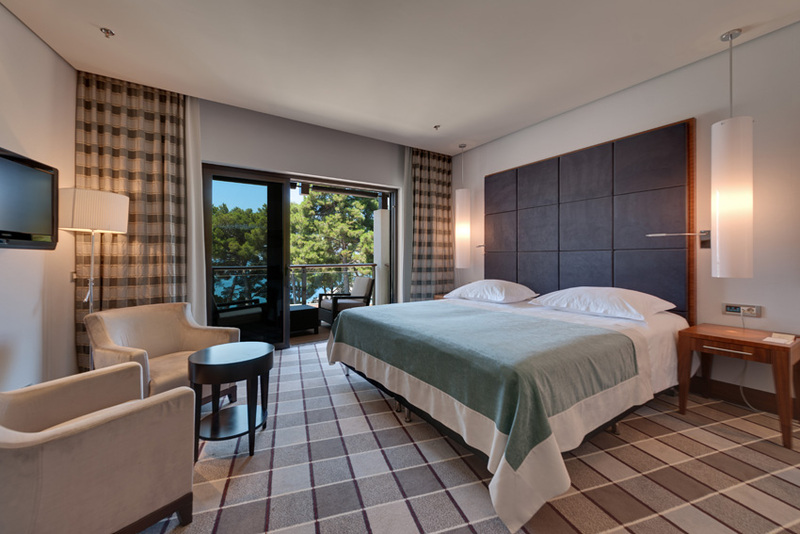 Junior suites comprise of a master bedroom with en-suite luxurious bathroom (all with both bathtub and walk-in shower), comfortable, light and spacious living and dining area, together with the kitchen, guest bathroom (shower only) and large balcony or terrace. All suites are equipped with mini bar, pay and satellite TV, direct dial phone, wireless Internet access, personal safe and a wardrobe that can be accessed from the entrance hall and the bathroom. One Junior suite is situated within the main building of the hotel and does not have a kitchen. Amenities: Complimentary two bottles of mineral water every day and use of the espresso coffee machine “Illy” with daily refill. Handmade local sweets and chocolate pralines once upon arrival. A wine and olive oil tasting and a 20-minute test treatment at our Wellness & Spa Center once during the stay. Luxurious toiletries, gift from the hotel and 100EUR gift voucher per suite to use in our a la carte restaurants. Free room service for breakfast. 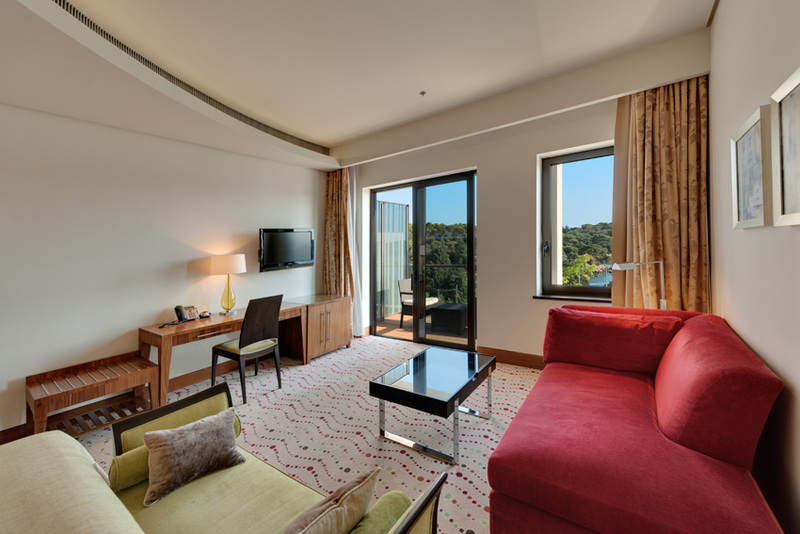 Two connected Premium rooms specially created for the comfortable stay of families (two adults and two children or one adult and three children). The Family rooms offer the comfort of two Premium room at a unique price. 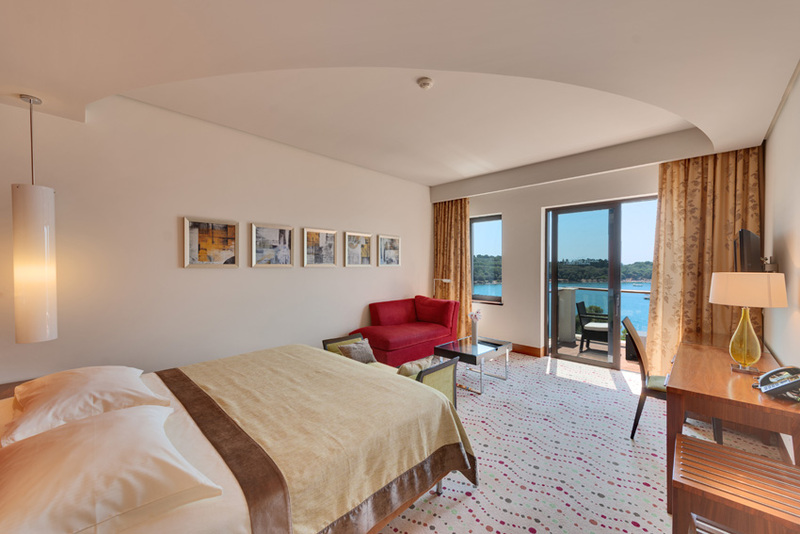 One room is available with king bed and red ottoman, the second with twin beds and a comfortable armchair. Executive suites have one master bedroom with en-suite luxurious bathroom (all with both bathtub and walk-in shower), comfortable, light and spacious living and dining area, together with the kitchen, guest bathroom (shower only) and large balcony or terrace, but offer more space than Junior suites. All suites are equipped with mini bar, pay and satellite TV, direct dial phone, wireless Internet access, personal safe and a wardrobe that can be accessed from the entrance hall and the bathroom. Two executive suites are located in the main hotel building and do not have a kitchen. The largest suites of the hotel Monte Mulini comprise of two spacious bedrooms, both with en-suite luxurious bathrooms (with both bathtub and walk-in shower), comfortable, light and very spacious living and dining area, together with the kitchen, guest bathroom (shower only) and large balcony or terrace. They are the ultimate choice for guests wishing to enjoy privacy, space and exquisite service. All suites are equipped with mini bar, pay and satellite TV, direct dial phone, wireless Internet access, personal safe and a wardrobe that can be accessed from the entrance hall and the bathroom.